The Mendocino area’s reputation for “live-and-let-live” was not always the norm. The local 1909 “dry” election, eliminating legal liquor sales and saloon licensing, grew from seeds planted decades earlier by Little River’s first pioneers. 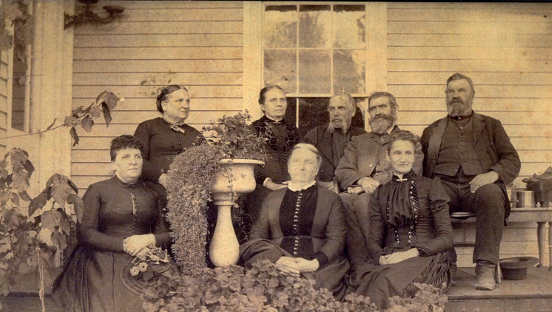 The Coombs, Stickneys, Stevens, Dennens, and other Maine families packed their belongings, and carried especially close their religious beliefs, morality, and state’s temperance history. These, as much as the customs and beliefs of pioneer laborers, would shape our early communities use and views of, alcohol. This two-part series briefly explores our Mainers western expansion of the booming anti-alcohol, pro-spirit movement of the early to mid 19th century. Alcohol use was common from the country’s earliest days. Colonists made and drank fermented brews—beer and hard ciders—instead of water. Not only were these considered safer than water, alcohol eased the burdens of work and daily hardships in the new country. During the Revolutionary War, escalating alcohol consumption ignited the first Eastern temperance organizations. Members pressed moderation—moral self-control—rather than total abstinence. By 1830 however, a new breed of alcohol—distilled spirits—rum and whiskey—took hold, spiking per-capita consumption to a whopping 88 pints for people over fifteen, three times higher than today. Child drunkenness was not uncommon. Wages went to the liquor sellers not families, and more people, particularly laborers, fell into debt, prison, or worse. Many believed the nation was drowning in a whirlpool of vice and destruction, with alcohol spinning the social well. The early 19th century brought the Protestant “Second Great Awakening.” Baptists, Methodists, and new Christian sects turned away from the harsh Puritan view of man as pitiful sinner. Redemption and hope were the new watchwords. Hope, preparing for the “second coming” and hope for the fallen, rescued by moral (Christian) living and social activism. Women and young people dominated the movement’s volunteer organizations and progressive agenda, which included the abolition of slavery, campaigns for women’s rights, prison reform, and proper care of the disabled and mentally ill. Foremost they rallied against alcohol, its purveyors and users, as proven degraders of family life, business, and society. Maine led temperance efforts in the early 1800s. The ten hometowns of Little River’s first settlers had established temperance groups by 1830. Persistent, well-organized recruitment drives distributed pamphlets and pledge cards, often door-to-door. Memberships soared. The Maine Temperance Society’s annual reports portray each town in gallons of liquor sold, inebriate disrupters and debtors in prison, broken families, and taxes collected to support the poor—most “intemperate.” All proved the downward spiral. By 1840, Mainer’s used the “local option” election to restrict or block the sale of liquor licenses. After a 25-year fight, in 1851 the state legislature passed “the Maine Act,” creating a national model of the first “dry” state. Condemned by wholesalers, saloon-keepers, and drinkers, this “ballot-box legislation” was deemed a “tyranny of the majority” over minority, particularly non-Protestant laborers. The outcome in Maine, as reported in New York Times October 3, 1851. A remarkable spectacle can be seen in the streets of the city of Portland (ME). Temperate men, and nothing but temperate men, walk her streets. No places are open to sell strong drink, and there are no visible signs of intoxication. A strange quiet prevails. The clamor, and rioting, and fierce turbulence of drunkenness are no where seen. . . .
With this win and the wind at their backs, the next decade our Little River families headed west. We don’t know if they were temperance activists back home, but their immediate organizing of Little River’s International Order of Good Templars and the Band of Hope says Maine’s temperance convictions traveled with them. “If you come down to see how the battle goes, just take a seat and wait a little while for I have gone up the gulch for some blackberries,” said Dora Bean Dennen’s undated note left for a friend. The “battle” no doubt refers to the temperance crusade. In the note, this anonymous verse. Nor pass my simple story by. that hates the traffic worse than I? Locally, I.O.G.T. members gathered children together for weekly, camp, and public meetings. Through anti-drinking songs, readings, and poems like Dora Dennen’s example, children portrayed the horrors of drunkenness, often from a child’s view. Pledge cards committed the young signer to a lifetime of abstinence. Devout Little River families formed the area’s first Lodge in 1865. There were no churches in the early settlement, but simple services and I.O.G.T. meetings used August Mahlman’s, “Pioneer House” hotel. In 1885, on land donated by Quaker, Isaiah Stevens, the Lodge opened its own hall across the road. Sometime after 1877, a temperance Free Reading Room was opened in Mendocino as an educational and social alternative to saloons. Mendocino’s I.O.G.T. lodge reorganized as a “Rescue Lodge” in 1880, constructing a hall in 1883 across from the Central Hotel. J.B. Fitch and Mrs. B.A. Paddleford were the first leaders. 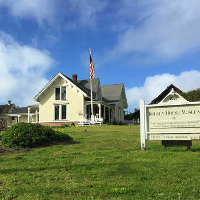 The Kelley House archives keeps a scrapbook of over 100 calling cards given by the Mendocino Band of Hope, honoring her dedication to the group and cause. The Band’s ledger—June 1889 to September 1994—includes lists of attending members. Nine year-old Nannie Flood, Florence Blair, Harold Packard, Sadie Milliken, the Cramer girls, and Eddie Brown were present on many a 1894 Sunday. Caspar, Westport, and perhaps Point Arena and Gualala also organized with Band of Hope chapters. All met to hear state and national temperance lecturers who plied the anti-saloon, anti-alcohol message up and down the coast. However, in 1885 the Mendocino Reading Rooms were apparently closed. Its Band of Hope disbanded in 1894. Alcohol-related social disruptions continued until the successful “local choice,” anti-saloon vote in 1909. Bootlegging along the coast began immediately, years before passage of the 18th amendment turned America “dry.” In the 1930s, the Little River I.O.G.T hall was given to the Little River Improvement Club, whose members still protect the building and its history.